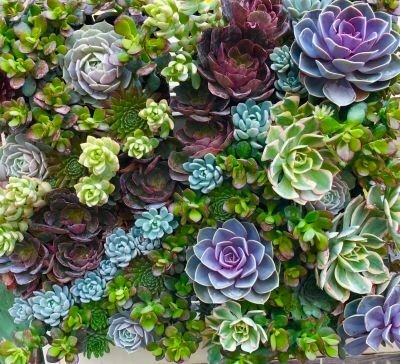 Chris and Roger prefer not to say how many years ago they first began collecting succulents, but while visiting Huntington Gardens in San Marino, California many years ago, they were intrigued by the bizarre and unique plants that they eventually came to know as "succulents". As all collectors know, all collections start with a single treasured item. In this case a single astonishing succulent. And of course, like all collectors know, it is hard to stop once you are enchanted by the beauty and variety of each species. Finding and collecting new and rare succulent varieties became an addictive hobby. Fascination with these beauties took them to many far away countries and they eventually began to import new varieties that were not commonly found in Canada. The collection slowly developed into one of the largest private collections in Canada, if not North America. The collection became so large that it seemed a natural next step to learn how to propagate and build a hobby greenhouse to care for these beautiful treasures. This "hobby" greenhouse was one of the first buildings they constructed on the current Solar Gardens acreage, a 50 acre property purchased in 1998. A wood fired pizza and bread oven, a summer kitchen (which is now a full fledged commercial kitchen) and ceramic studio were constructed over the years, and more commercial greenhouses have been added to house the ever-expanding succulent collection. Their love of gardening inspired them to create a truly unique garden centre. They are continually working on the grounds and the landscaping of Solar Gardens. For as any gardener knows... a garden is never complete. Chris and Roger believe that constant evolution and change is what makes gardening (like business) such a captivating endeavour. Planning, building, landscaping, planting, refining, pulling weeds (and more weeds) is all part of the process that they cherish. Their love of variety meant investments in a restaurant with the incredible 'take me to the church' dining hall, patios and greenhouse expansions, as well as a Tasting Studio for their delicious line of extra virgin olive oils and balsamics, as well as food products from around the world.